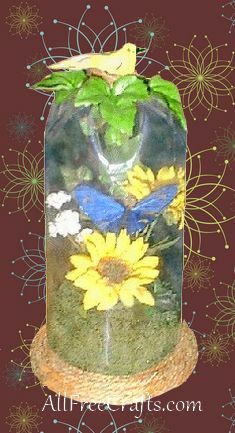 Make a domed floral display from a recycled pop bottle. The Victorians often displayed an arrangement of dried flowers, or even stuffed birds or animals, under a polished dome of glass. Our recycling craft project borrows the same idea – but we’re very glad to say that no animals, birds or butterflies were sacrificed to make it. First wash your bottle and tear off the wrapper. There will be a little of the wrapper left from the glue so rub this off with a q-tip and turpentine or polish remover. Down from the top of the bottle you will find a line that goes all the way around the bottle. Pierce this line with a knife blade, then switch to a pair of scissors to cut all the way around. Now you have the dome. Take the circle of styrofoam and insert it in the bottle bottom. Trim, if needed, to make sure it fits inside. Remove the styrofoam. Glue the styrofoam to the middle of the wood base. Glue moss all around the stryofoam. Now add the flowers and greens of your choice in the middle of the moss. Make sure your flowers and green are not too tall for the dome. You want your arrangement just a little smaller than the dome. Add a little butterfly to the flowers. Now put the dome over the flowers, and re-adjust the arrangement, if needed, so the flowers and decorations are displaying correctly. Glue some leaves on top of the soda bottle dome, then add a nest and a bird. The nest is optional. Lastly, glue some household twine around the bottle and wood circle. Enjoy!